At first glance, you might suspect that this oak tree is suffering from some kind of disease. But close inspection reveals that this tree is actually has vein pocket galls. So, what exactly are “galls”? They are the work of tiny insects that lay their eggs inside the leaves. While gall formation is not totally understood, it’s thought that plant hormones react to saliva from the insects and cause leaf cells to grow in exaggerated ways. 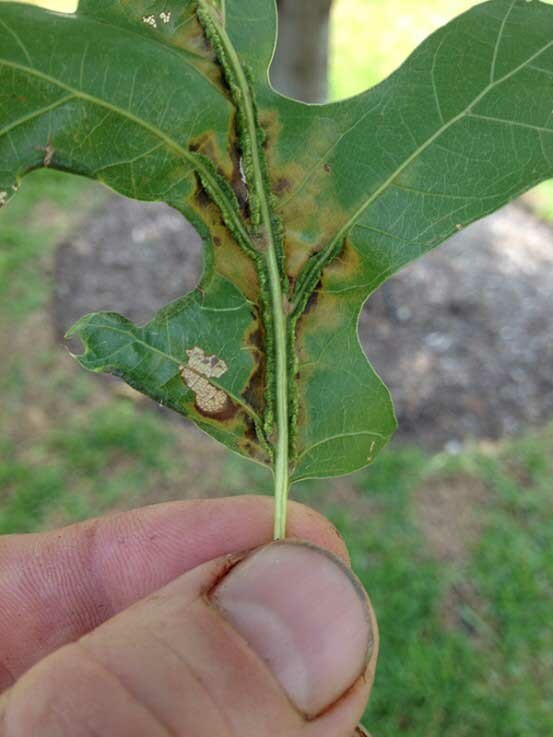 In the photo, you’ll see swollen ridged tissue along the mid-vein of this oak leaf. This is called a vein pocket gall and is caused by the vein pocket gall fly (Macrodiplosis quercusoruca). It lays its eggs on the undersides of oak leaves in spring. As the larvae emerges and begins feeding on the leaves, plant hormones react and the ridges form along the center of the leaves. Chemical control of these kinds of galls is very difficult. Your best bet is to focus on the long term health of the tree by boosting its immune system through proper watering and feeding. An organic landscape maintenance plan will surely be a benefit. To discuss how our Soil Building Program can keep your entire landscape healthy and vigorous, contact us this fall.